MzAttack -- Identify note attacks in the audio data. Generates a detection function and also uses that function to decide where actual note attacks in the audio are located. A function in the range from 0 to 1. A value of 0 means that a note attack at that time in the audio is very unlikely. A value above 0.2 means that the existance of an attack at that location in time is highly likely. Using the attack detection function, this output gives estimated locations of note attacks in the audio data. The black curve is the attack detection function, and the orange lines are the detected attacks. 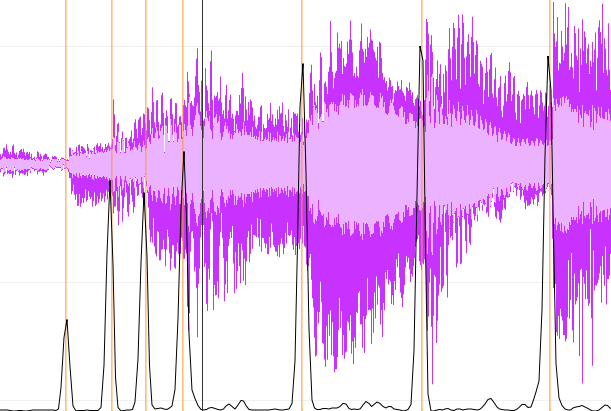 The output data is super-imposed on top of the original audio waveform which is shown in purple. Initial draft of the plugin, should improve with some more work. The detected attacks contains significant false negatives, but not too many false positives. Compiled versions of the MzAttack plugin can be downloaded from the download page.